England: Three men Animal Equality exposed abusing pigs charged with animal cruelty offences. The workers, named as Artis Grogprkevs, 31, from Goxhill; Gavin Hardy, 39, from South Killingholme, and Troy Wagstaff, 30, from Grimsby, will appear in court next month. All three men have been charged with causing unnecessary suffering to pigs by inflicting blunt force trauma, physical violence and using a pitchfork inappropriately, shocking footage of which we exposed earlier in the year. Investigators visited Fir Tree Farm several times between 1st and 27th April 2018 after an anonymous tip-off about animal cruelty from a brave whistleblower. They recorded serious and repeated violent abuse of pigs by members of staff, including repeated incidents of pigs being violently kicked in the face and head. Workers were also filmed slamming gates on pigs’ heads, repeatedly jabbing pigs with pitchforks and laughing at the abuse. 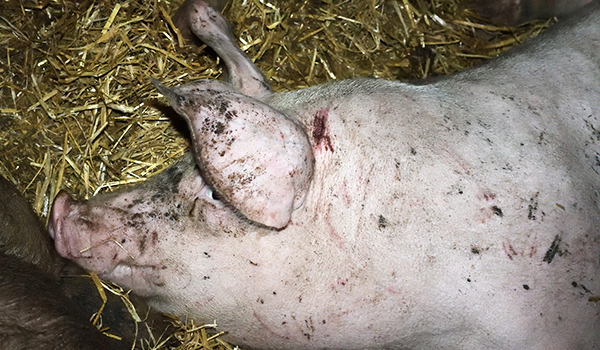 Scarred and wounded pig resulting from abuse on Fir Tree farm. Animal Equality passed all of our evidence to the RSPCA and welcome the news that they have now pressed charges. The three men in question are due to appear at Grimsby Magistrates Court on November 22. We expect them to face the full force of the law for this sickening and inexcusable abuse. Footage from this investigation shocked the nation and we had many people contact us to say they had given up eating pork or were making the switch to a vegetarian diet as a direct result. It’s thanks to generous supporters like you that we’re able to carry out investigations like this one, bringing animal abusers to justice and showing people the truth behind the food they’re eating. Please, help us continue this lifesaving work by donating today. He had lost the fear of the wolf! England: Enjoy Your Halloween ! May the spirits be with you. Meet Your Meat – Part 2. Picture above – EoA (NL).